Barcelona, the capital of Spain’s Catalonia region, also happens to be the cosmopolitan, cultural, and architectural capital of Europe. This city generally consists of modern and contemporary expressions of art and architecture, such as the Sagrada Família church. However, it is also a city with some great archaeological sites wherein you can go back into the annals of time. 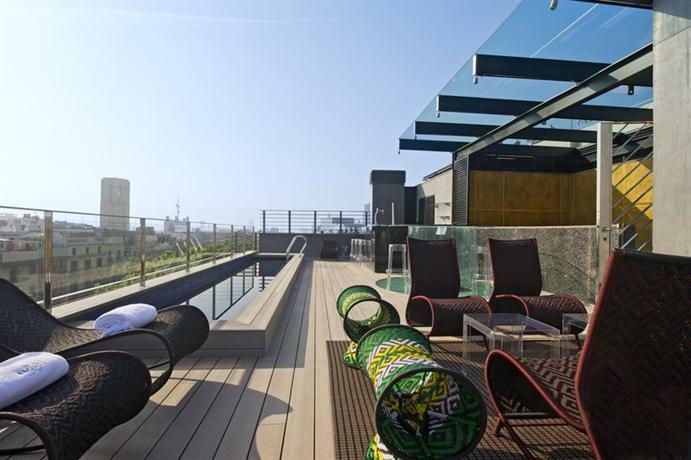 Barcelona has a number of great boutique luxury hotels from which you can visit different sites in the city. Below we’ve described the top 10 luxury hotels in Barcelona so that you can plan your travel in an informed manner. The Hotel Arts is a minimalist luxury five star hotel present completely on the beach, facing the sea. This can be great if you’re fond of the ocean, and if you like waking up with the sound of ocean waves lapping up against the shore. However, this also means that you’re quite cut-off from the main city and its attractions. Because the public transport in Barcelona isn’t very widely available you’ll end up taking a lot of cab rides into town. However, if you don’t intend to go into the town much, you can find plenty of beach side restaurants in and around the vicinity of this luxury hotel as well. As far as the aesthetic sense of the hotel is concerned, it feels old-school in its service, however it’s very contemporary and minimalist with its efficient, bright, and very sleek rooms. The lobby of the hotel is truly stunning with a great floral display, and the surrounding gardens are over ground level, so it makes the whole hotel feel wonderfully green. There are some rooms from which you can look out into the sea, and then there are those from which you can look out into the city, however there are also those few special rooms which offer you a view of both! 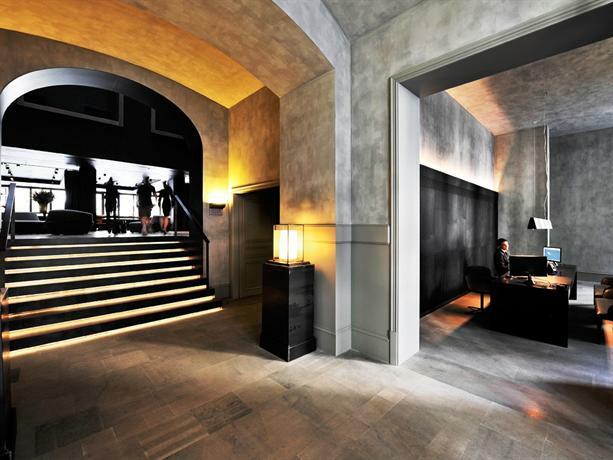 W Hotel is yet another boutique luxury hotel with the same advantage and drawback. It’s located on the edge of a beach, with the waves gently lapping up against it. This can be extremely pleasant if you’re looking for a chill and comfortable beach-side stay, however it leaves you far removed from the cultural nightlife of the city. If you love seafood though, then you’ll find plenty of great restaurants just within walking distance. The luxury hotel rises up in the visage of a giant Sail, and hosts lots of extravagant parties at nights. This aesthetic has very clearly been inspired by Dubai’s Burj al-Arab hotel, however the imitation feels well earned and executed. The roof of the hotel also features a couple of private cabins, and a swimming pool, and the view from this vantage point is simply stunning. The rooms are quite simple and even plain, designed to resemble the sand and the sea, however the stunning views make up for it entirely. 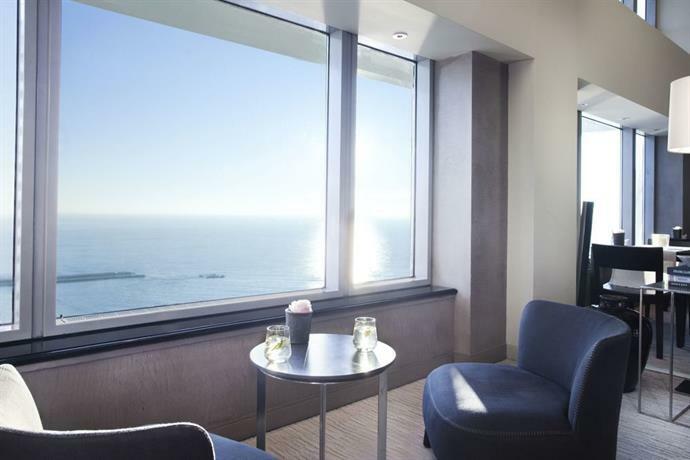 Depending on the room, you could either be looking out at the sea or the city, and you’ll also be given telescopes to really look far and wide. This is yet another luxury hotel located in Passeig de Gràcia, and thus it’s great for shopping experiences. However, you should be prepared to be met with some truly expensive price tags. While this location isn’t close to the beach or the Old City, it does attract a lot of public transport, buses, and taxis, and as such you won’t have any trouble getting around. 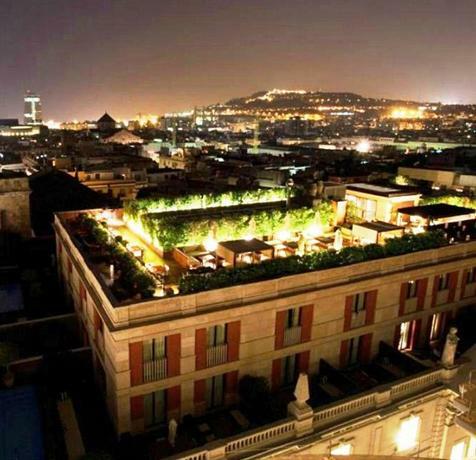 The hotel has been designed predominantly in the neoclassical style, but with modern bathrooms and bedrooms. This hotel seems to be at the very forefront of minimalism, with vast stretches of marble, columns, and staircases, all designed in a chic and minimalist style with gentle creamy color palettes. The rooms feature striped wallpapers that match the aesthetics of the rest of the hotel. 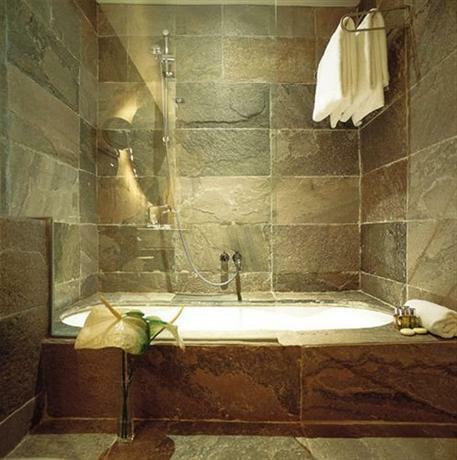 The bathrooms are replete with Bvlgari toiletries, and guests even get complementary Nespresso machines in their rooms. 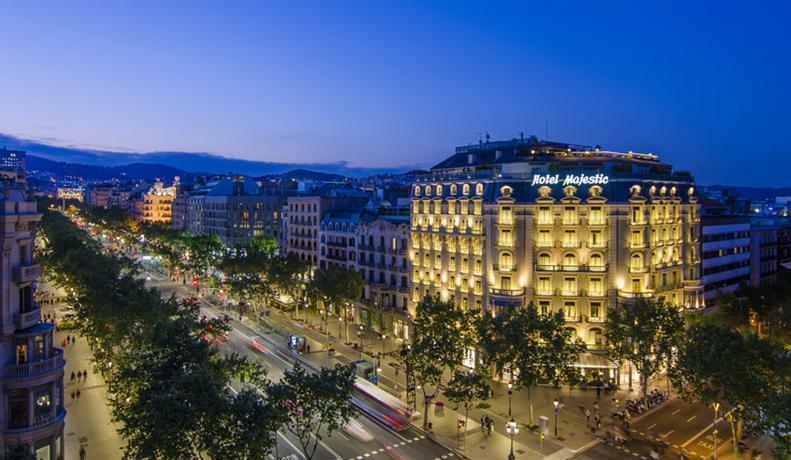 The Mandarin Oriental is a luxury five star hotel located in Passeig de Gràcia, and as such it is in close vicinity to the city’s finest and most expensive shopping centers. If shopping is not your thing, you can also head on over to appreciate Gaudí’s architecture. The hotel is really quite eclectic and has a certain charm that cannot be replicated. The moment you enter the lobby of the hotel, you can feel the sheer weight of opulence all around you. While this might get to be too much for some people, for others still it is simply delightful! The basement features a soothing spa, and the area just outside the hotel features a Mimosa restaurant. The rooms aren’t very large, though the suites are. However, they’ve all been designed in a minimalist style with cream and beige color palettes predominating, thus adding a gentle aura to the room which keeps them from feeling too stuffy. In addition to this, you’ll also be pampered with little extras such as chocolate boxes, aromatherapy toiletries, and even some leather-bound notebooks that you can use! If you want a nice boutique hotel that is located on a solitary and quiet street, and yet remains accessible to the city attractions, then Mercer Hotel is the one for you. You have to travel on foot down an alley to reach Barri Gòtic, the street where this charming hotel lies. Once you exit from the pedestrian walkway, you’ll easily find plenty of transportation to take you around. You can also simply walk on over to the Born neighbourhood, or visit the cathedral. The hotel itself is a remnant of history, still preserved in its medieval standing, with necessary renovations of course. The walls of the hotel are left intentionally blank, and the rooms have cream coloured walls, thus lending the hotel a charming rustic aura. This luxury hotel was designed way back in 1919 by Caesar Ritz, and as such this is actually one of the original Ritz hotels, one of the finest in all of Barcelona. It went through a renovation in 2005, which brought it the new name, however it still bears motifs and details of an Old European style. For example, the doormen wear top hats as a part of their uniform, the lobby features a wide red carpet, and the pillars and columns are all marble-clad and onyx. There’s even a giant crystal chandelier tinkling away in the midst of the lobby. 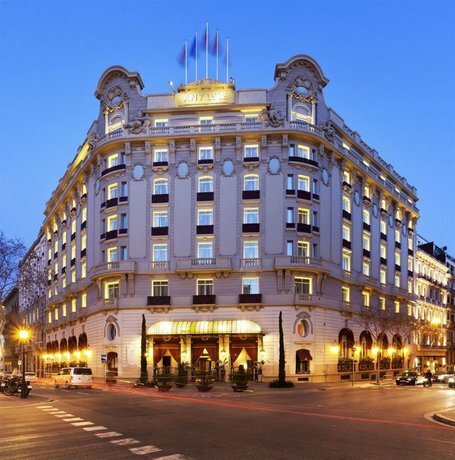 Located near the Passeig de Gràcia, the Hotel Palace is great for those who love shopping, or those who appreciate modern architecture, however it’s quite far from some other popular sites like the Beach, or the Old City. So, if you want a trip back to history, or a trip to the beach, you might want to skip this hotel. The interiors of the hotel are really opulent and extravagant with dense and intricately designed rugs and silk draperies, however the Baroque nature of the lobby is somewhat assuaged with the neoclassical leanings of the rooms which are decked up in cream and ivory shades with marble tiled bathrooms. Some of the bathrooms even feature Roman-styled mosaics that have been left over from the hotel’s previous incarnation. If you’re in need of something to eat, you can head on over to Diana's Garden rooftop terrace, which offers great snacks, a stunning view, and a lovely pool! 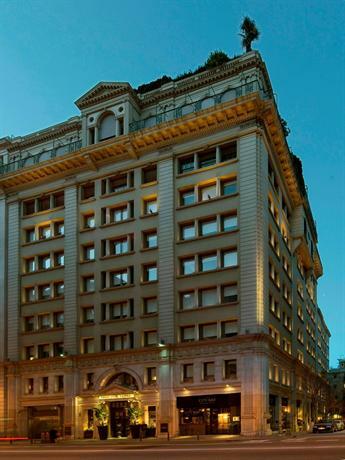 The Grand Hotel Central is a luxury five star hotel that truly embodies its name. It has a grand architectural design with a predominantly Art Deco aesthetic replete with a grand spiraling staircase, bronze doors, and a sharply decorated lobby. The rooms and suites are slightly in contrast to the common areas, preferring a gentler and lighter aesthetic with wooden flooring and earthy hues. As far as location is concerned, it’s very central, opposite the popular cathedral, and lying strategically between the Gothic and Born districts of Barcelona. The buzzing cultural scene of La Rambla is within walking distance, and if you want to go somewhere further, you can walk over to the Jaume 1 Metro station. 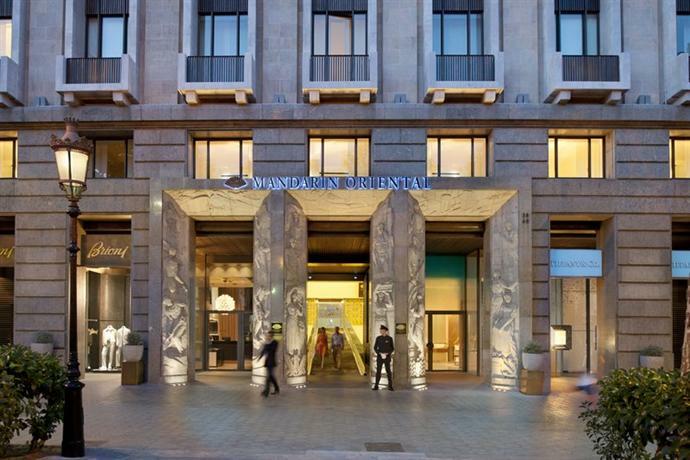 The Le Meridien is a luxury hotel located right in the midst of La Rambla. This is great because this is about as central a location as it gets, and you can walk over to important sites such as the La Boqueria market. However, the only disadvantage to being located in such a prime area is the fact that it is always crowded with tourists, and that can get really annoying really fast. The interiors of the hotel are charming, as they focus on creativity with details such as red lacquer cabinets, colorful bathroom tiles, and other equally eccentric designs. Located in Poblenou, Melia is a luxury hotel located in a neighborhood much favored by designers, yet it is yet to come up to its full stature. 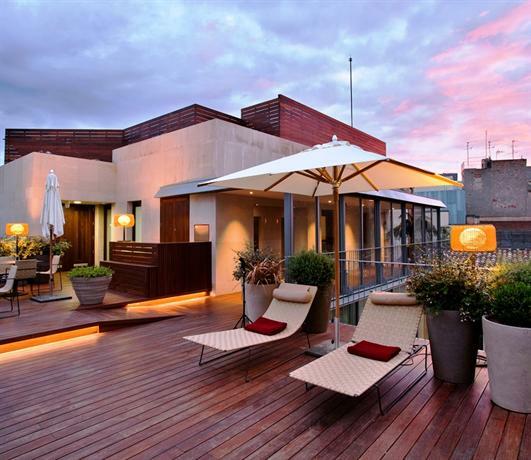 It is located mostly on a business area, and features a few charming restaurants in Rambla de Poblenou. Furthermore, the hotel is quite close to the beach and so that’s a relief. The five star hotel is mostly aimed towards businessmen and people on a work trip, decked up with glass panels and grey rugs in the hallways. This isn’t for everyone, only those who truly need these qualities. 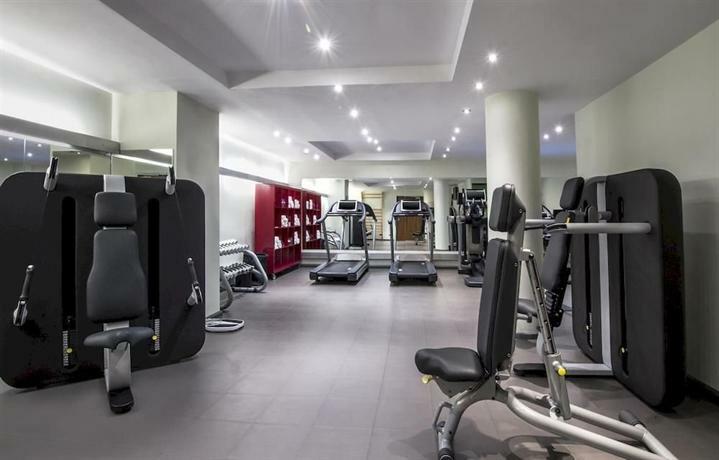 Located near Passeig de Gràcia, this luxury boutique hotel is well connected to the rest of the city through the easy access to public transport, and it’s ideal for those looking for a shopper’s haven. The luxury hotel is also within walking distance of two stunning Gaudi buildings, La Pedrera and the Casa Batlló. The hotel is a perfect blend of classical styles with modern designs, the high-vaulted ceilings feature eccentric lamps and even chairs. It is also extremely technologically advanced when it comes to matters of security. In order to enter your room, you need to get through a fingerprint scan. The Hotel Bagues is well situated on La Rambla, is right next to the Boqueria food market, and you can easily walk over to Plaça Catalunya, which is the transportation hub of the area. However, because of its perfect location it’s also always crowded with tourists, which takes away from some of the glory of the location. The aesthetic sense of the hotel is quite erratic in that it features styles as diverse as leopard skin, ebony, venetian glass, and others. However, all these styles come together to feel wonderfully comfortable. 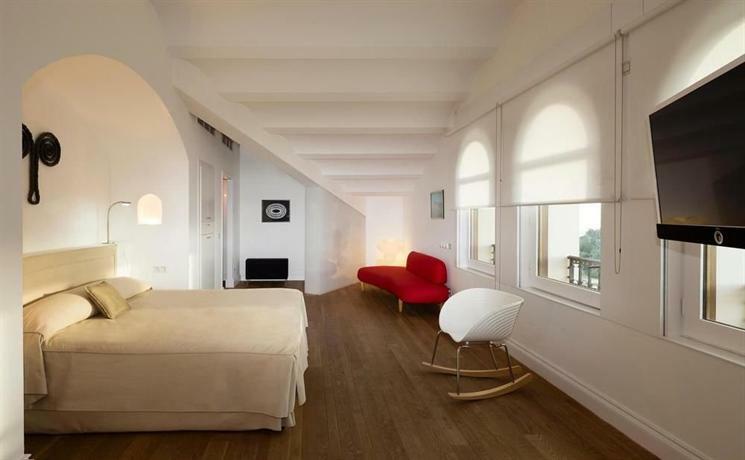 The rooms are all unique and individual in nature, whereas some of them feature bath tubs others don’t, and while some of them face towards Betlem church, others look over La Rambla. As such, you should clearly state your preferences while getting the rooms. This boutique hotel is ideal for those who want a relaxing stay at a luxury hotel, and don’t want to be hassled much by the crowds of the city. It’s located next to the sea, and as such it can be perfect for some solitary time, however it’s very difficult to go to the city because of the lack of public transportation. 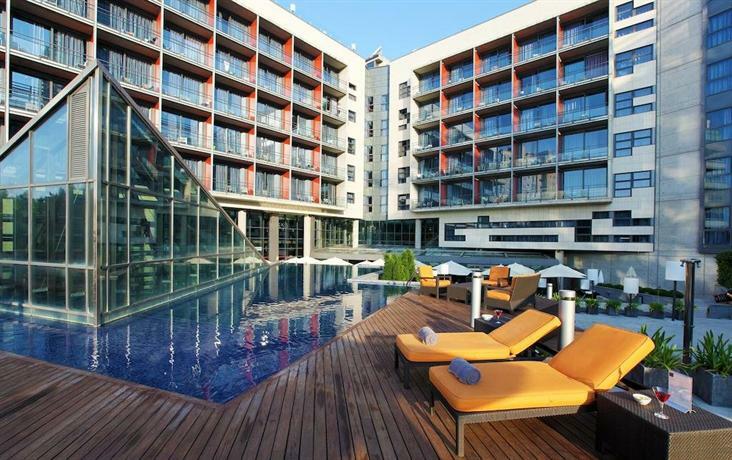 The hotel also features a nice terrace garden, with a lovely pool in its midst. It features a waterfall that produces a sound that replicates the cadence of the ocean waves itself. The rooms feature a red wall, along with wood panelings and carpeted floors. There are leather armchairs around the rooms, along with pressing irons, kettles, and even a menu of pillows! The bathrooms feature separate bath and showers, and they have toiletries from C. O. Bigelow. 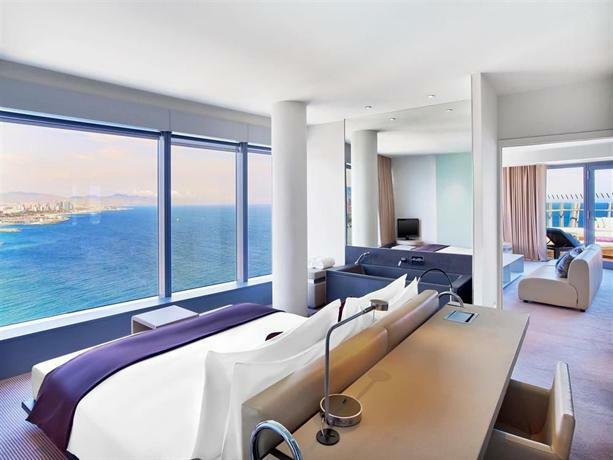 If you want a sea view, you should get a room above the third floor, and if you also want a private balcony, you should get a Superior room instead of a Standard. This charming hotel retreat is usually favored by the more seasoned travelers who are looking for some peace and solitude in style, as opposed to those who are looking to mingle with the crowds and engage in activities. 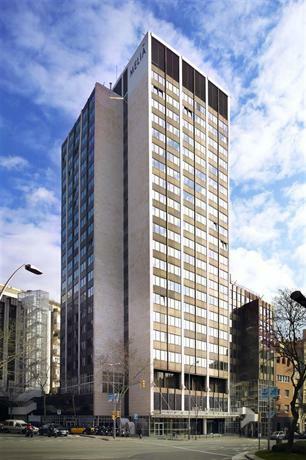 A 20 minute drive would bring you to the city centre, which leaves the hotel quite secluded. However, if you want a tour of the city, you can hitch a ride on one of the free shuttle services. The hotel was established in 1925, and it bears a distinctly Spanish look with a contemporary leaning. The lobby itself is a sight to behold with wrought iron and dark wooden paneling, along with some great sculptures and floral designs. The rooms bear a color palette of dark wood, along with coffee toned hues. In stark contrast to the previous hotels, the Hotel 1898 is a boutique luxury hotel smack right in the center of all the action. It’s located in La Rambla, quite close to Plaça Catalunya. As such this is very well located and accessible to all other parts of the city, however during peak holiday season it’s so crowded with tourists that it can honestly get quite overwhelming. The Hotel 1898 used to be a Philippine Tobacco Company headquarter, and as such they make sure to retain that heritage as a distinctive selling point, with the use of bold candy stripes and a colonial facade. This makes the entire hotel seem wonderfully eccentric yet elegant. The Neri is located in a manner so as to bring you some peace and quiet, while also being well connected to some great eateries and tourist attraction spots. It’s located on a pedestrian street so you can’t go to it via public transport and would have to walk to it by foot. The hotel features large elegant chandeliers, along wth plush velvet sofas so as to make it feel grand and regal in style. All the rooms also feature unique murals on the walls over the beds, and this helps add a touch of personality to this charming boutique hotel.